Could your lower back pain be caused by your old mattress? Could your lower back pain be caused by your old mattress? Did you know that back pain is one of the most common types of pain felt by people in the US? We are constantly putting stresses and strains on our backs that culminate in back pain — especially lower back pain. It’s possible that your daily activities can cause your lower back pain, but if you are sleeping on a rough mattress or are sleeping in a certain position, this certainly won’t help ease your lower back pain. A mattress that is too firm or too soft can put pressure on your back, side, joints, and more, exacerbating your pain across the eight or so hours you sleep. You may wake up feeling stiff or unrested. One way you can tell if your mattress is to blame is if you wake up and immediately experience back pain. If you find yourself struggling to get a decent night’s sleep, tossing and turning, and waking up frequently, your mattress may be to blame for that as well. It is said that your mattress should be replaced every eight years. 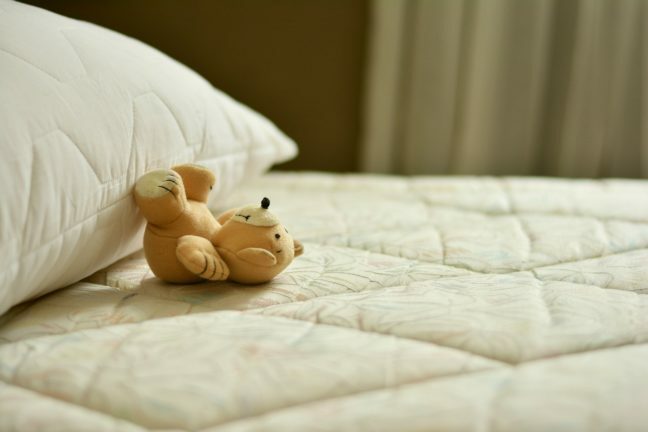 How old is your mattress? While your personal preference affects what kind of mattress you may purchase, make sure to avoid purchasing a too-firm or too-soft bed. While it makes sense that a too firm mattress will place pressure on your body, a too soft mattress can make you sink down into the bed and affect your sleeping posture. What is the worst sleeping posture for lower back pain? What is the bed sleeping posture for lower back pain? When you’re asleep, you want to try to do anything you can to keep your spine in line, and keep your joints from uncomfortably lying on top of one another. Pregnant women have it right! Just making the small adjustment of putting a pillow between your knees can help keep your legs, hips, and spine all in alignment. Give it a try! This can cause stress and strain on your neck and back. Try sleeping on your back instead. How do I shop for the right mattress? Since so much of mattress shopping is based on personal preference of firmness versus softness, it may be a deeply personal decision. Speak with the sales person at the shop and let them know what you are looking for. Oftentimes, these sales people can help suggest to you a mattress that fits your particular needs. Don’t feel obligated to buy a mattress the same day, either. Give it some thought and weigh out your options. There are lots of options for mattresses that can help relieve back pain both online and in store. Consider where you’re feeling pain with your current mattress and consider even the structure of your bed, including the possibility that you may need a box spring or platform bed if your mattress is not eight years old, lumpy, or misshapen. You may even wait until you go away on vacation, because once you sleep on an unfamiliar bed you may be able to pinpoint exactly what’s wrong with your own bed. What mattress is your favorite? Let us know in the comments below!